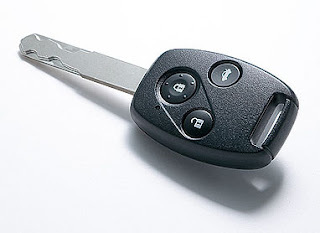 Keyless entry is a wonderful thing, no question about it. But I liked the no-frills version on my old car (a '96 Saturn) better than my fancified new car (an '07 Civic). See, the old one never made me feel like a moron. There's something to be said for simplicity. The old car locked (with a beep, very satisfying) when I hit the lock button, unlocked the driver's side with one press of the unlock, and the rest of the doors with a second press. Simple. -The first locking action is confirmed only with flashing parking lights; the second press adds a horn beep. Handy for those who are coming home late and want to be quiet. But that ain't me, so I wish I could just get the beep every time. With pretty much everything in modern cars controlled by a central computer (is this actually true? ), it should be easy to allow the consumer to toggle a setting like this - like the 5mph auto-lock feature, which can be turned on or off. Carmakers, give me the freedom of choice! -The doors won't lock if any door is open. Sure, sure, it's for my protection, so I don't lock myself out - but rather than patronizing all customers, Honda could allow users to change this setting as mentioned above. Having to wait until everyone shuts their doors before I can lock up is wasting valuable seconds! And hitting that button for the first time and watching nothing happen was very confusing. -The doors will lock if the trunk is open, but the car won't confirm it; I can hear the doors locking, but that stoic little Civic will neither flash its lights nor beep its horn. I guess this is because it doesn't want to falsely assure me that the car is all locked up if the trunk is open. But I count that one as a bit obvious... am I the only one? -Finally, just a gripe: there's a bit of a lag. It's just a little too long, too large of a fraction of a second, between hitting that button and getting the audiovisual feedback that you subconsciously, viscerally crave like the drug fix that it is. A car is a quick, precise, responsive machine at its best - a tool of instant gratification. It needs to feel that way all the time, and in every way. The takeaway lesson for this one seems to be freedom of choice. Cars are durable goods - though every user will start as a first-time user (finding the headlight controls versus the windshield wiper controls, all that jazz), they'll almost all become experienced users eventually. Designing for both is a classic challenge, and the best way might just be to let the users change the product as their proficiency of use develops. When anyone gets a new car, it's a good idea for it to be idiotproof; just don't keep treating the driver like an idiot. "Carmakers, give me the freedom of choice!"